Windows 10 build 17093 is now available for Fast ring insiders. The new insider preview build comes with new features, bug fixes, and various other improvements. In addition, there are improvements for the Game bar, Diagnostic Data, Graphics improvements, Eye Control, Windows Security, Bluetooth, Microsoft Edge, Input, Windows App Permissions, Ease of Access improvements and much more. Check out full details below. users can now delete the Windows Diagnostic Data that Microsoft has collected from your device. In Settings> Privacy > Diagnostics & feedback, you will find a delete button that deletes the Windows diagnostic data associated with your device. New Graphics settings for Multi-GPU Systems: Introducing a new Graphics settings page for Multi-GPU systems that allows you to manage the graphics performance preference of your apps. You may be familiar with similar graphics control panels from AMD and Nvidia, and you can continue to use those control panels. When you set an application preference in the Windows Graphics settings, that will take precedence over the other control panel settings. Find the page by going to Settings > System > Display and scrolling down to the “Advanced graphics settings” link. (In future flights, you will see this link as “Graphics settings”.) Once you’ve chosen the application, click on the application in the list and then click the “Options” button. The “Power saving” mode is a request to run the application on the most power saving GPU available. The “High performance” mode is a request to run the application on the most high performance GPU available. Generally, the power saving GPU is the integrated GPU on a system, and the high performance GPU is the discrete GPU or external GPU. If you have both a discrete GPU and an external GPU on a system, the external GPU is considered the high performance GPU. 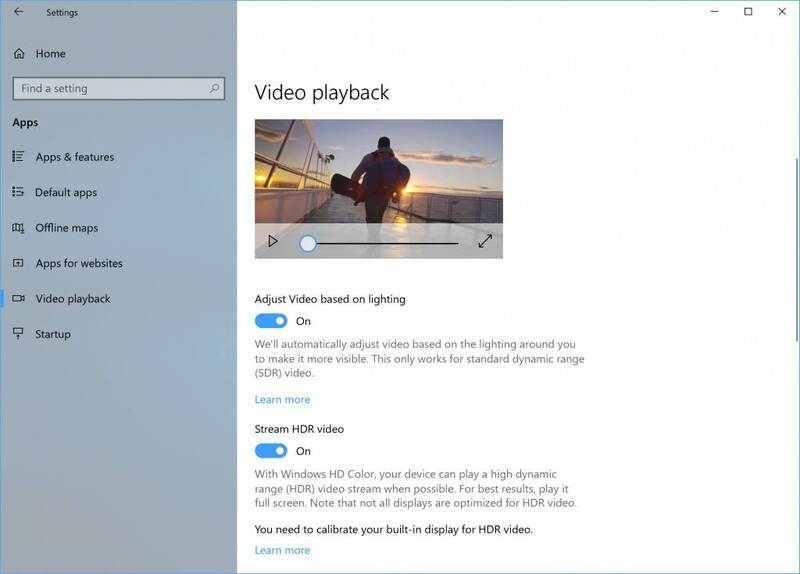 Expanding HDR video access to more users via new functionality via Settings > Apps > Video playback. If the “Stream HDR video” toggle can be switched to “On”, your device can be calibrated for HDR video. With Windows 10 S you don’t have to! Just download the Authenticator App and use it to set up your Windows 10 S PC. You will be able to go through the out-of-box experience, set up Windows Hello and access all your favorite apps and services – all without ever having to enter your password. Navigate more easily: Adding the ability to more easily scroll content, like email and websites. In addition to precise mouse control, we’ve incorporated direct left click and direct right click capabilities into the launchpad. Pause when you need to: Added a pause button on the launchpad. Eye control users now have the flexibility to hide the launchpad for uninterrupted reading, streaming, or relaxing without accidental clicking. Re-engaging the launchpad is simple too – just glance at the pause button in the top or bottom middle of the screen. Streamlined Pairing and Connecting to Certain Bluetooth Devices: Starting with this build, Windows enables users to start pairing and connecting supported devices in a single click. When these devices are ready to pair and detected to be in range, Windows shows a notification to the user allowing them to quickly and conveniently start the pairing process. Updating this experience so that without leaving full screen you can now access the address bar and navigate to other sites, add a site as a favorite, and more. To do this, simply hover your mouse at the top of the screen while in full screen mode, or using touch drag a finger down from the top of the screen, and the familiar controls will appear. Updated Privacy Settings navigation pane: To improve visual acuity, we’ve added new categories to the Privacy Settings navigation pane. WSL is more configurable with wsl.conf: We added a method for you to automatically configure certain functionality in WSL that will be applied every time you launch the subsystem. AF_UNIX allows socket connections between Linux processes on WSL and Windows native processes: WSL and Windows applications can now communicate with each other over Unix sockets. Imagine you want to run a service in Windows and make it available to both Windows and WSL apps. We fixed an issue where the network flyout didn’t have an acrylic background (Yay Fluent Design!). We fixed the issue causing VPN clients installed via the Microsoft Store to not work after upgrading to Build 17083. We fixed an issue where the Home text label was missing from the Settings navigation pane. We fixed an issue where Windows Security in Settings was missing an icon in the navigation pane. We fixed an issue where dropdowns in the new App volume and device preferences page under Sound Settings were truncated when the Settings window wasn’t wide enough. We fixed an issue where the new App volume and device preferences page under Sound Settings might have duplicate apps listed. We fixed issues with the slider controls for sound under Settings > System > Sound and “App volume and device preferences”. Thanks @MSWindowsinside, @CrazyCatsGot2 and @TheScarfix for reporting this! We fixed an issue in Windows Update Settings where if you’d selected restart to kick off an upgrade and then canceled the restart, the restart button in Settings would no longer be functional. We fixed an issue where the data limit dialog on the Data Usage Settings page had no margins. We fixed an issue where permissions for inbox apps were cleared out when upgrading to recent builds, resulting in you being unexpectedly re-prompted to enable or disable these permissions when you launched an impacted app. We fixed an issue where the Advanced display settings link was missing from Display Settings. We fixed an issue where going to Focus Assist Settings might crash Settings. We’ve updated the “Use my sign-in info…” text in Sign-in Options settings to be more clear. We fixed an issue where clicking the search entry from the app command menu of certain apps would crash explorer.exe. We fixed an issue where the night light quick action in the Action Center sometimes didn’t work due to a long running calculation of the schedule to automatically turn on/off night light. We’ve updated the Action Center context menu such that the three focus assist states are now collapsed under one expandable entry. We fixed an issue where sharing to Cortana Reminders wasn’t working in recent flights. We’ve updated the OneDrive Files-on-Demand state icon in File Explorer’s navigation pane so they now display closer to the file icon. We fixed an issue where burning an ISO file to CD threw an unexpected error “Selected Disc image file isn’t valid” in recent builds. We’ve updated the People flyout to now use your accent color when “Show accent color” is selected in Color Settings. We have fixed the issue where Win32 apps pinned to Start would display as blank live tiles that show only a name starting with “W~”. We fixed an issue where the Start layout might get reset if you upgraded straight from the Anniversary Update. We have fixed the issue where using Task View to switch to an app might result in touch not working properly in that app. We fixed an issue where using the new right-click options to delete groups of activities from Timeline might not delete the entire group. As we prepare RS4 for release, we’re removing the feedback button in Task View that was introduced for Insiders to give feedback on Timeline – thanks everyone who’s logged feedback so far! We welcome you to continue giving feedback via the Feedback Hub under the Desktop Environment > Timeline category. We fixed an issue where the text label for creating virtual desktops in Task View was truncated in certain languages. We fixed an issue where the app icons in the Open With dialog might appear pixelated on high DPI screens. We fixed an issue where music wouldn’t re-route back to audio peripheral if you skipped to next track before connecting the USB or Bluetooth audio device. We fixed an issue where the Windows.old folder wasn’t completely emptied and removed after cleanup. We fixed an issue where using Ctrl + Alt + Break in Hyper-V didn’t work to make a VM re-enter full screen mode. We fixed an issue where vmconnect couldn’t insert or eject an ISO/DVD drive. We fixed an issue that could result in lower frame rates in games in certain monitor configurations. We fixed an issue resulting in audio from Microsoft Edge sometimes becoming unexpectedly muted in the last few flights. We fixed an issue where when using Microsoft Edge with dark theme the text in the address bar might become black on dark grey. We fixed a number of issues impacting Microsoft Edge reliability in the last few builds. We fixed an issue resulting in opening a new tab in Microsoft Edge in recent builds potentially taking an unexpectedly long time. We fixed an issue resulting in Microsoft Edge file downloads to secondary drives failing in recent flights. We fixed an issue resulting in SVG images on certain websites not rendering in Microsoft Edge. When dragging a website from the address bar in Microsoft Edge in order to pin it to the favorites bar, you will now see the favicon and website name follow your mouse as you drag. We fixed an issue from recent builds where content copied to the clipboard using Web Notes in Microsoft Edge couldn’t be pasted. We fixed an issue where certain PDF files wouldn’t display their context menu correctly in Microsoft Edge. We fixed an issue resulting in Microsoft Edge potentially crashing on launch when using roaming profiles. We fixed an issue resulting in not being able to scroll components of certain websites when viewed in Microsoft Edge despite a scrollbar being visible. We fixed an issue resulting in not being able to use Flash on certain sites in Microsoft Edge in recent builds. We fixed an issue resulting in Microsoft Edge crashing recently if you clicked on the page when in caret mode. We fixed an issue in Microsoft Edge in recent builds where clicking on link’s in the ‘Ask Cortana’ sidebar might open the page inside the sidebar instead of the main window. We fixed an issue from the last two builds where certain websites didn’t load in Microsoft Edge, although the name of the website was correct in the tab. We fixed an issue from the last two builds where an unexpected grey rectangle was visible in Microsoft Edge settings next to the word Settings. We fixed an issue from the last build where processes in Task Manager only showed at most 100mb of memory used. We fixed an issue where Narrator wouldn’t say anything if you were to use the arrow keys to navigate through text typed into Command Prompt. We fixed an issue an issue where the touch keyboard might be a pixel-width up from the bottom of the screen if the display scaling wasn’t 100%, leading to the keyboard unexpectedly dismissing if you tapped that area. We fixed an issue an issue resulting in the one-handed touch keyboard being unexpectedly large in recent builds. We fixed an issue from recently builds where shapewriting in the touch keyboard would stop showing text candidates if you were using it, dismissed the keyboard, re-invoked the keyboard, and tried to start shapewriting again. We fixed an issue from recent builds impacting Emoji Panel invocation reliability. Some PCs will fail to resume from hibernate requiring a hard reboot to recover. If an East Asian keyboard is the only input method on your system the touch keyboard will show an English layout with no IME on/off key. Until this is fixed, the workaround is to add a second keyboard language from the Region & Language Settings page, or to use the IME mode button in the taskbar. We’re investigating an issue where the Japanese IME sometimes can’t turn on in UWP apps. If you encounter this issue switch to a Win32 application (e.g. Notepad), turn the IME on there, then switch back to the UWP app. We’re investigating reports that 3 and 4 finger gestures on the touchpad have become unresponsive starting with the previous flight. Windows Hello will fail to work on Surface Laptops with this build. After Game bar closes, the mouse cursor resets to the position it was in when Game bar was opened. Keyboard and mouse input may not work correctly in Game bar when playing a first person game (e.g. Minecraft). Alt+Tab out of and into the game should fix this.